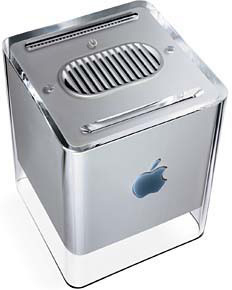 Announced in July 2000, the PowerMac G4 Cube introduced a dramatic new case design. 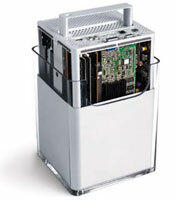 Housed in an 8x8x8 cube, the G4 Cube combined the elegance of the iMac with the power of the PowerMac G4. The G4 Cube was a foray into the business market, as well as an answer to those who wanted an iMac-like machine, with more choice in monitors. The Cube traded expandability for its diminutive size: There were no PCI slots, and while the Graphics was fit into an 2x AGP slot, there wasn't room for full-length AGP cards. With the exception of PCI expansion, the Cube was as versatile as it's larger G4 cousin: Three RAM slots, an AirPort slot, and two USB and FireWire ports. One gripe many people had with the Cube was its lack of conventional Audio input and output. Instead, it came with an external USB amplifier and a set of Harman Kardon speakers. The amplifier had a standard mini-plug headphone output, but there was no mic included, and having USB as the only sound-input option was considered limiting by many. Shortcomings aside, the Cube was a remarkable feat of engineering, crammed inside an elegant case. The Cube shipped to retail markets with a 450 MHz G4 processor, a 20 GB hard drive, a 56 kbps modem, 64 MB of RAM, and Apple s Pro Mouse, for $1799. Another configuration was available through the Apple Store, with a 500 MHz G4, a 30 GB hard drive and 128 MB of RAM, for $2299. Gigabit Ethernet was available as a BTO option. The Cube was not nearly the success that Apple had hoped it would be. The consensus was that Apple had misjudged the market, making the Cube an expensive "luxury" computer instead of a cheaper monitor-less iMac. In december the low-end configuration received a price cut to $1499. In February 2001, The cube received a feature and price change. The low-end configuration was repriced at $1299. A "better" configuration was made available, with a CD-RW drive and 128 MB of RAM, for $1599. Finally, the high-end version got a 60 GB hard drive, 256 MB of RAM, a CD-RW drive and an 32 MB NVIDIA GeForce2 MX video card, and sold for $2199. The PowerMac G4 Cube was never officially discontinued, but in July 2001 Apple suspended production of the Cube indefinitely. While leaving the door open for a possible reintroduction of the enclosure, Apple quickly and quietly let the world forget the disappointing failure of the G4 Cube.